Publication drawing; Skye, Loch Chaluim Chille, Monastery. Insc: 'Monastery, Chaluim Chille'. 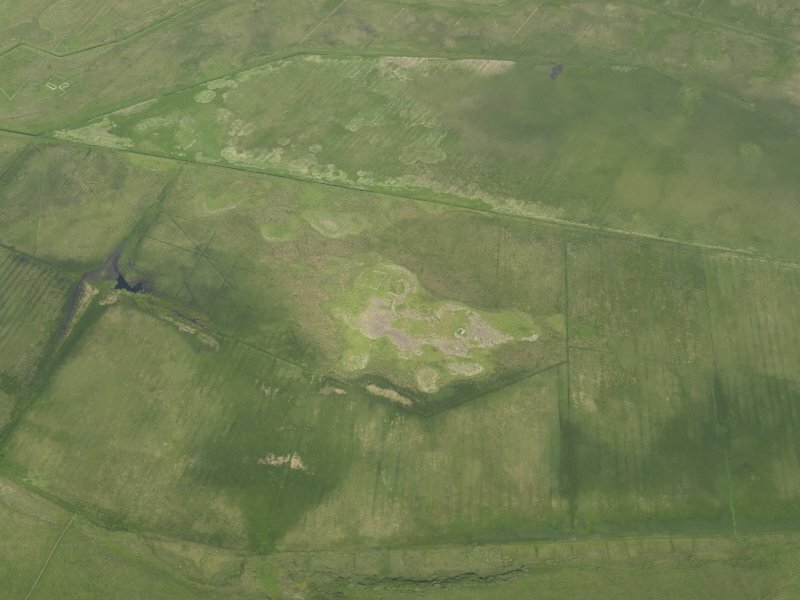 Oblique aerial view centred on Eilean Chaluim Chille, taken from the SW.
General oblique aerial view centred on Eilean Chaluim Chille, taken from the SW.
Oblique aerial view centred on Eilean Chaluim Chille, taken from the SSW. 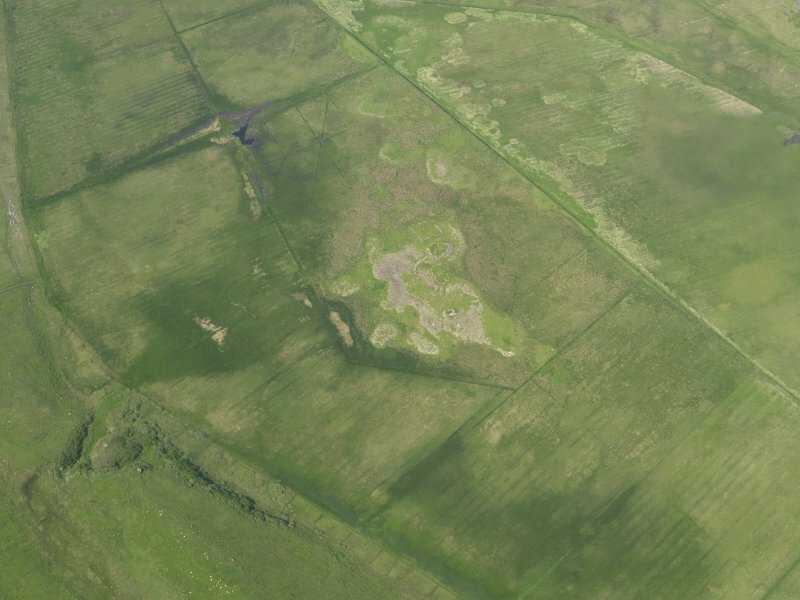 Oblique aerial view centred on Eilean Chaluim Chille, taken from the SSE. Plane-table survey; Skye, Loch Chaluim Chille, Monastery. Insc: 'Monstery, Chaluim Chille'. Skye, Loch Chaluim Chille, Monastery; causeway and building. NG36NE 2 3770 6879 to 3771 6888. 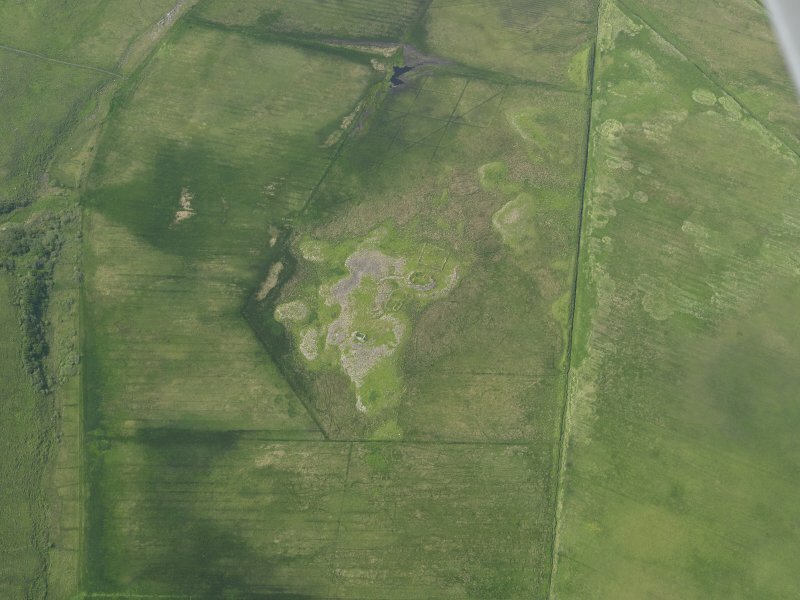 Nearly 1 mile N by W of Monkstadt is an extensive meadow, the bed of Loch Chaluim Chille before it was drained. On two slightly elevated plateaus which were small islands before the water was drawn off, are the remains of a church and a cashel. The church (NG 3770 6879) rectangular on plan, is built of stone and lime, the lateral walls 2'6" and the gables 3'6" thick still standing to a general height of 4' or 5' above the fallen debris in the interior. It lies ENE and WSW and measures internally 21'6" in length and 12' in breadth. The door, 3' wide with scarcely any splay on the jambs is placed in the northern wall 5'4" from the Western end, and there is a splayed window in the centre of the E gable. 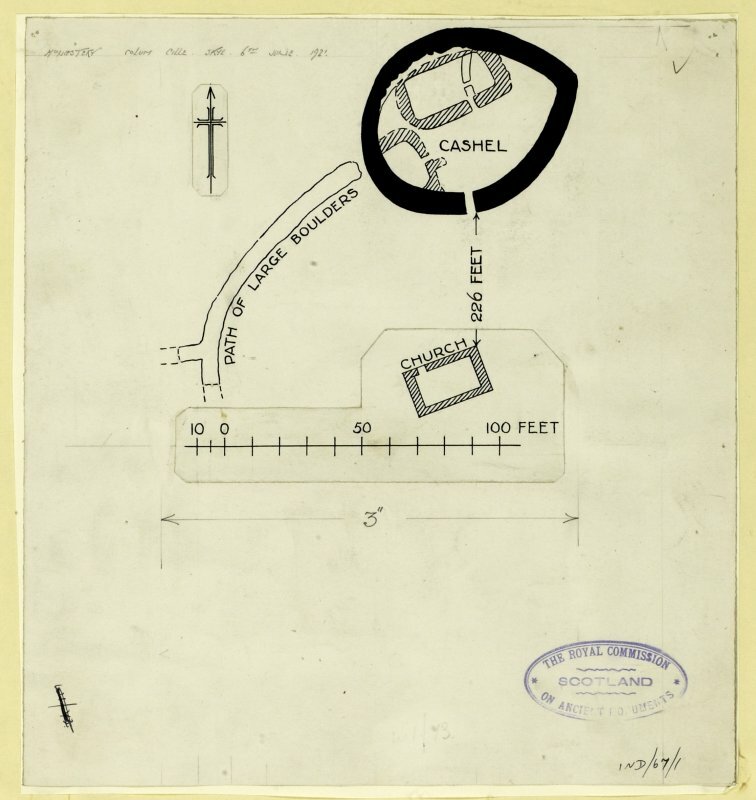 The cashel (NG 3771 6888) which lies 75 yards N of the church and occupies the entire area of the island on which it is built, is egg-shaped on plan, measuring internally 68' from ENE to WSW and 50' in breadth. 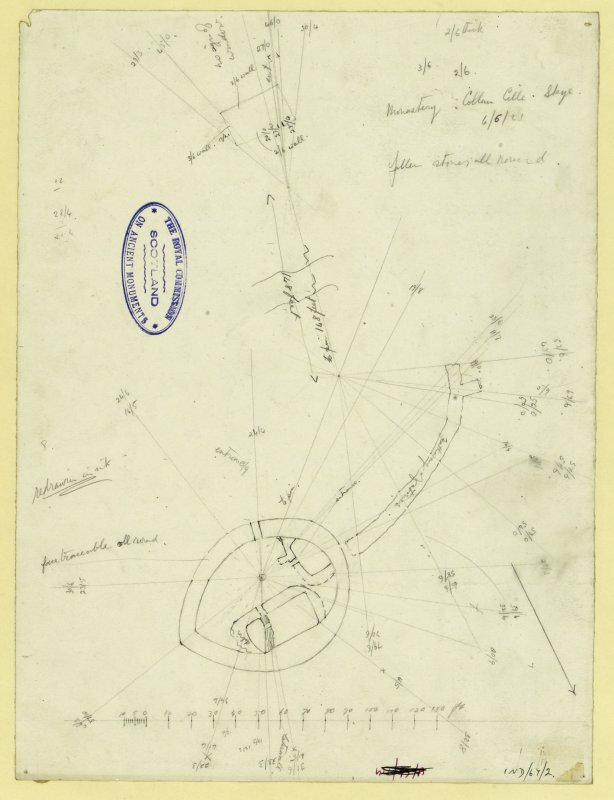 It is enclosed by a drystone wall varying in thickness from 7' on the W to 8' on the S and E, and to 11' on the N. Within the cashel are two enclosures;one in the SW segment is an irregular oval, and the other against the N wall is rectangular. The former measures internally 19' in length and 12'6" in breadth, the latter 32' in length and 15' in breadth internally, with a doorway in the S wall. The enclosure appear to be secondary. 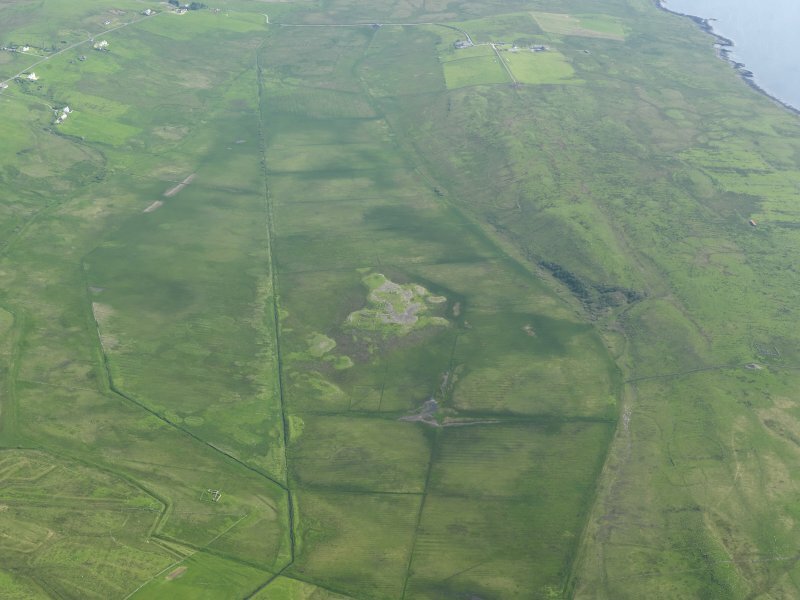 The cashel is connected by a causeway 100' in length, 5' or 6' in breadth, and 2' high, which runs from the SW in a southerly curve to the NNW extension of the plateau on which the church is situated. The entrance of the cashel, lies on the S side facing the church. Earlier writers draw attention to a few aspects of this site not dealt with by RCAHMS. Muir (T S Muir 1861) notes an intermediate building between the church and the cashel consisting of little more than the foundation of an oblong building 49' in length, standing N-S, divided by a thick wall into two rooms of unequal dimensions, and with what seemed to be a close or garden on the N and W Reeves (Adamnan 1857) says that the ground adjacent to the church is covered with the debris of the walls, and that at short distances are patches of ground covered with grey stones which appear to have been the sites of conventual buildings. These are probably the 'Town' mentioned by a 17th century writer (W Macfarlane 1906-8). Pennant (T Pennant 1772) calls it a monastery of great antiquity with cells and several rooms still very distinguishable. He considers the chapel, built with mortar to be of later date. 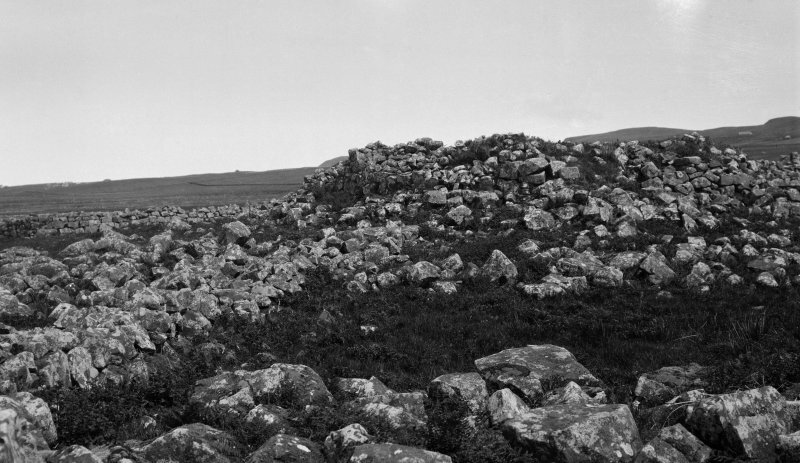 Simpson (W D Simpson 1927) unreservedly accepts Loch Columkille as one of Columba's foundings calls it a typical specimen of a Celtic monastery. T Pennant 1772; Adamnan (W Reeves ed.) 1857; Orig Paroch Scot 1854; T S Muir 1861; W Macfarlane 1906-8; RCAHMS 1928; M Martin 1934. Monastery of St. Columba as described above and in a ruinous condition. Visited by OS (A C) 15 April 1961. The cashel with causeway is generally as planned by RCAHMS but occupying only about half the island on which it stands. The wall, boulder faced with rubble infill with vertical outer face, appears to be 2.1m thick for most of its periphery and stands to a maximum height of 2.0m. The entrance in the S is partly obscured by tumble. The buildings within are a depopulated house with out-buildings. The chapel (rather than a church) is generally as described by RCAHM except that the alleged window in the E gable is almost certainly a blocked doorway 0.8m wide. Between the chapel and the cashel is a depopulated farmstead, referred to by Muir, which together with the buildings inside the cashel are probably the 'town' referred by the 17th century writer. In the vicinity of the chapel are traces of walls which appear to be contemporary with the farmsteads. Visited by OS (R L) 8 September 1971.